The Inquiry recommendations will be delivered in three stages aligned with major milestones as the industry develops. 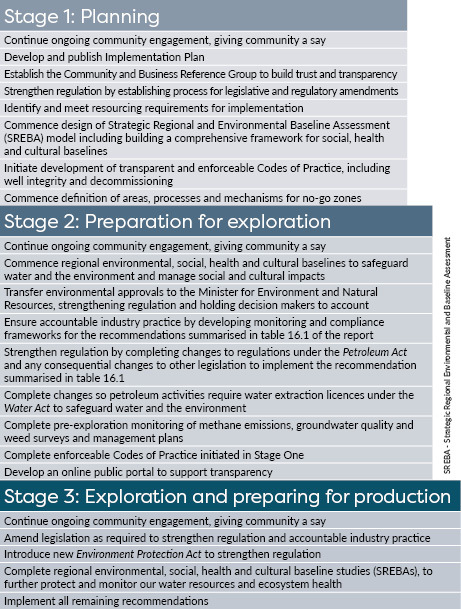 Stage One outlines the tasks following the lifting of the moratorium. It covers setting up the governance arrangements for implementation, establishing the Onshore Shale Gas Community and Business Reference Group and starting work on some of the major reform areas. This Implementation Plan is the major milestone in Stage One. Stage Two comprises implementing the recommendations that need to be done early including those that the Inquiry determined must be complete before any exploration involving drilling or hydraulic fracturing and stimulation of unconventional wells. commencement of a broader Strategic Regional Environmental and Baseline Assessment (SREBA). Our goal is to complete by the end of 2018. Stage Three covers the balance of the Inquiry recommendations and will take a number of years to complete. Stage Three must be completed before any production approvals are granted for unconventional gas. Many of the actions in Stage Three are still in planning and the detailed approach will be published in online updates to this plan. Actions in Stage Three may commence before Stage Two is complete.